I was a little apprehensive about lunch. Lin Heung Tea House is an old school establishment for the masses. Its attraction lies not in the food - which was ordinary and certainly nowhere near the level of places with Michelin stars - but in the ambience and the experience. People go there and have to literally fight for a table as well as fight for their food. It's a quintessentially Hong Kong experience, but Sheets had asked me to tone down the visitors' expectations - especially for Monsieur Ducasse. We arrived at the appointed time and I led our visitors to the table at the back of the restaurant. Sheets was already there with a few members of his family - including Auntie and Uncle Five. We were also having lunch with an elderly gentleman who is technically not family - not related by blood, at least. Turns out he's an electrician who has worked for the family-run restaurant for some 60 years! Sheets gave a little background on the place. His grandfather had come over to Hong Kong in 1922 and started the business on Queen's Road Central, before moving to its present location on Wellington Street some 20 years ago. They still lease their current premises, which is surprising and may become an issue. They open for breakfast at 6 a.m., although usually it doesn't get really busy until 7:30 a.m. or so. From that point on they're generally packed throughout the rest of the day until after 10 p.m., just before closing at 11 p.m. Daily number of covers range from 1,200 - 1,500 or so. For dim sum the menu shows a selection numbering in the mid-20s (although I suspect many old school items aren't actually listed), and the menu has a large number of cooked dishes, rice, as well as noodles. We ended up getting what I thought was a lot of food. We mostly waited for the family to decide what to put on the table, and there was quite a variety. The meal started well enough. The family passed around a roll of toilet paper in lieu of napkins - which is quite common in this part of Asia - and that drew a few chuckles from our visitors. Definitely a new experience for them! 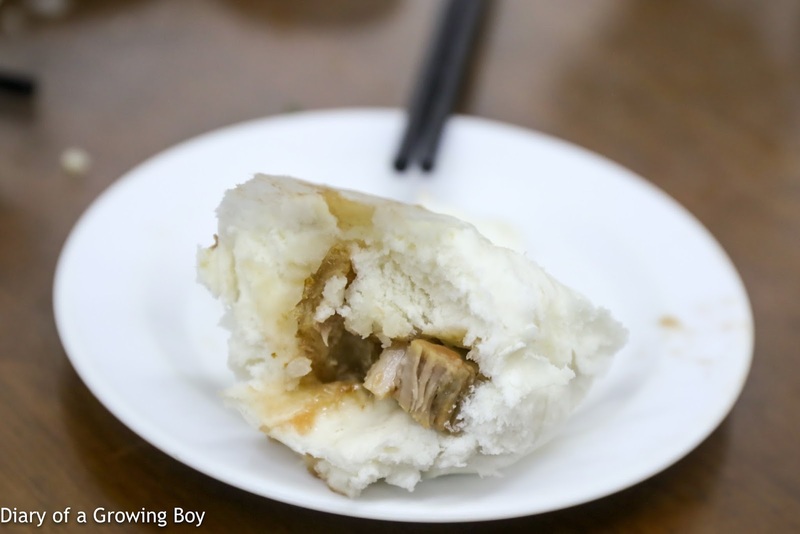 We had steamed rice flour rolls with minced beef (牛肉腸粉), fish cake rolls (魚崧扎), steamed glutinous rice with chicken (古法糯米雞), siu mai with quail eggs (鵪鶉蛋燒賣), steamed prawn dumplings (蝦餃), deep-fried tofu skin with prawns (鮮蝦腐皮夾), as well as steamed buns with chicken and pork fillings. There were also dishes such as stir-fried beef noodles (乾炒牛河), deep-fried crispy noodles with shredded pork (肉絲炒麵), choy sum (菜心), steamed minced beef patty and fried egg over rice (煎蛋牛肉飯), and steamed brown sugar sponge cake (馬拉糕). Our visitors were curious about the deep-fried egg crullers (蛋散), but upon hearing the description their immediate reaction is "Ah, beignets!"... and promptly lost interest. Oh, and if anyone is wondering whether Monsieur Ducasse partook in that most classic of dim sum dishes - the sight of which sends many non-Asians into convulsions of horror... the answer is YES. He ate chicken feet. Out of respect for the master, I didn't snap any pictures of him sucking on it and spitting out the bones - or any pictures of him at all, for that matter. But I didn't need to, because that image has been burned into my memory for all eternity. We left after about an hour, as Monsieur Ducasse needed to get back for appointments on his schedule. In any case I don't think he could take in any more of the ambience... Having arrived less than 24 hours earlier, they were no doubt suffering from a combination of jet-lag, sleep deficiency, and perhaps excessive alcohol consumption (thanks to moi). Under those circumstances, their tolerance for the noise level and the amount of activity buzzing around us was perhaps a little on the low side. We thanked Uncle Five and the family for their hospitality, and bid farewell to our hosts.